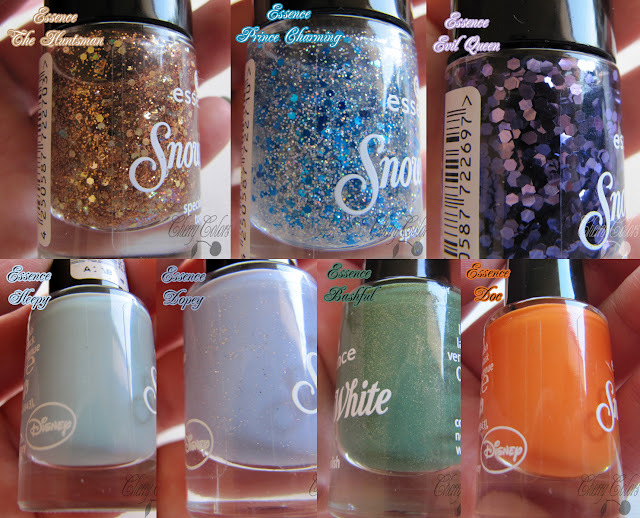 Essence Snow White TE + swatches - Cherry Colors - Cosmetics Heaven! I was searching for this collection from Essence for a week or two, when I finally got lucky and found it in a completely different place than I expected (Postojna DM). I wanted all the toppers and some of the dwarves, Snow White just wasn't my cup of tea (since I already have an almost identical nail polish from Canmake). I didn't pick the brown, yellow and electric blue (this one because they didn't have it) from the collection, but other than those - I have them all! *Bashful: I didn't like it in the store, but after I looked really good at it - I loved it! It's a gorgeous dark green with golden micro glitter. Easy application, two coats. *Sleepy: A nice light blue cram polish, that does dry really quickly. This means the application has to be super quick or you just need one coat. Other than that, it's nothing special. *Dopey: Gorgeous lilac polish, that from all of them is the less opaque. It's a 2-3 coater (depends on how thick you apply it) with tiny silver glitter. Quite a fresh shade in my collection. *Doc: A very bright orange nail polish, that is an one coater. It dries really quickly! Other than that it's perfect for summer, but nothing really special. *The Huntsman: For me this is the prettiest topper from this TE. It's the easiest to work with from all three. I noticed some plastic glitter in all the 'mess'. It looks weird and it's big. What does it do in such a pretty polish? *Prince Charming: A lovely glitter, that goes from holographic to blue. From tiny to big chunks of glitter. *Evil Queen: This one is seriously one hard topper to work with. I used two coats and even with those I needed to be careful on how I place the glitter. Using a toothpick did its job.